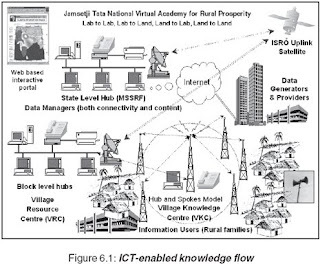 The Village Resource Centre (VRC) programme was initiated by ISRO during the year 2004, to facilitate overall development at village/ community level, by delivering the variety of space technology enabled products and services directly to the grassroots. The first set of VRCs were set up in Tamil Nadu in association with MS Swaminathan Research Foundation, Chennai. Year by year the more and more VRCs have been set up and at present there are 473 VRCs spread over 22 states/Union Territories. The programme is being implemented in association with selected NGOs, Trusts, Universities/institutions and Government agencies and as of now there are 45 partner agencies involved in the programme. Major attraction of VRC programme is the knowledge connectivity, which is enabled through the two way audio video linkage to various expert centres. The expert centres provide services in the areas of agriculture, animal husbandry, skill development, floriculture, fisheries, water resources; tele health care; woman’s empowerment; supplementary education; computer literacy; micro credit; micro finance etc. So far more than 6000 programmes have been conducted and around 4,00,000 people have availed the services. The above services are provided at VRCs either through online or offline mode. Expanding the network requires additional satellite bandwidth, infrastructure, HUB, servers etc. ; ISRO is working in this direction. It is also proposed to set up an exclusive Content Server for storing and retrieving Programmes across the network. Indian Space Programme started in early 60s has become largely self-reliant with capability to design and build satellites for providing space services and to launch those using indigenously designed and developed launch vehicles. Over the years, India has achieved a notable progress in the design, development and operation of space systems, as well as, using them for vital services like telecommunications, television & radio broadcasting, meteorology, disaster warning, natural resources mapping, monitoring and management. Space based services, emanating from Satellite Communication (SatCom) and Earth Observation (EO) satellites, holds considerable value to transform village community. Primary issues related to eradication of illiteracy, better health care, training on better jobs, enhancing agricultural productivity and ensuring proper drinking water management etc., can be facilitated by digital connectivity and remote sensing. Tele-education, for example, enables non-formal education, strengthens supplementary teaching mechanisms, and facilitates interactive training and skill development processes to the rural community. Similarly, tele-medicine facilitates specialist doctor-to-doctor consultations; doctor to patient consultations, besides strengthening medical extension and health care related training in the rural areas. EO enables community centric spatial information in terms of geo-referenced land record, natural resources, suitable sites for potable/ drinking water as well as recharge, wastelands for reclamation through rural employment creation, watershed attributes, environment and infrastructure related information. Synthesizing spatial information with other collateral and weather information, EO also facilitates locale specific community advisory services. Disaster management support, community based vulnerability and risk related information, early warning and extreme weather information dissemination mechanisms provide reliable disaster management support at the village level. To reach the benefits of Space Technology to the rural, distant and remote places, ISRO launched Village Resource Centre (VRC) programme in association with NGOs, Trusts, State Govt. Dept. as well as with academic/research institutions. The VRC programme aims to promote a single window delivery of need-based services in the areas of education, health, nutrition, agriculture, water, weather, environment and alternate livelihoods to the rural population. First cluster of VRCs were set up in Tamil Nadu in association with M S Swaminathan Research Foundation, Chennai (MSSRF) in 2004. Prime Minister of India inaugurated these VRCs. From this modest beginning, at present, there are 473 VRCs spread across 22 States and Union Territories. At present there are 45 partners/associating agencies involved in the programme from NGOs, Trusts Government, Academic institutions. Each and every partner involved in the programme have got their own specializations and experience in the field of rural development. ISRO has piloted several socially relevant space application projects on mission mode basis. With the appropriate technological and institutional base, ISRO has taken up newer social missions, wherein space applications could be integrated with other IT and e-governance related services and brought closer to the community. The effort has now focused on to effectively disseminate the portfolio of services emanating from the space systems - as discussed above, as well as from other Information Technology (IT) tools, directly down the line to the rural communities, through the Village Resource Centres. Some of the other ICT initiatives taken up by the Government in India are setting up Village Information Kiosks like ‘Akshya’ in Kerala, ‘e Seva’ in Andhra Pradesh, ‘Gyandoot’ in Madhya Pradesh etc. Some of the other initiatives by private and NGOs are ‘E choupal’, ‘Village Knowledge Centre’(VKC), ‘Drishtee’, Common Service Centres (CSCs) of IT Department, Govt. of India etc. These Kiosk systems are being used for a variety of applications like information directories, customer self service terminals, internet access terminals etc. Experiences from these projects suggest that the information needs of the community should be thoroughly assessed before the launch of the project and knowledge connectivity is the basic requirement. ISRO’s initiative on Space enabled Village Resource Centre (VRC) is an effort in that direction. The VRCs, aimed at serving essentially as Community Resource Centre and addressing the dynamic and critical needs of rural communities. The VRCs are linked to various expert centres in different states to provide information support to the Village Resource Centres in local language. VRCs can directly interact with the experts through two way audio video interactivity. The expert centres provide services in the areas of agriculture, animal husbandry, skill development, floriculture, fisheries, water resources; tele health care; woman’s empowerment; supplementary education; computer literacy; micro credit; micro finance etc. The VRC communication network is Very Small Aperture Terminal (VSAT)-based and which has two way audio and video connectivity. It enables each expert node to multicast the advisory, and enables each of the participating VRCs to raise questions. Expert node software enables a video return link for each VRC in such a way that all participating nodes can listen to the expert and also the questioner, along with viewing them. The VRCs / expert centre / specialty hospital are equipped with a VSAT antenna of 1.8 m in diameter, with 2 W BUC and a satellite modem. As baseline start-up configuration comprises of 1 multimedia PC, 2 speakers, 1 amplifier, 1 cordless microphone, and 1 HandyCam with stand. This configuration is able to cater to 30-40 people as regards listening and conversation, and viewing tele-consultations and advisories on the PC screen. Each VRC is capable of transmitting 384 Kbps of multimedia traffic. Tele education: Skill development, vocational training/capacity building, supplementary teaching, non-formal , adult education, computer training/education. Tele health care: VRCs provide positive, preventive and curative health care services. Facilities are provided for Telemedicine consultations with specialist doctors. Awareness creation on malaria, dengue, chickungunya, AIDS, women and child health could be carried out. Discussions on traditional medicines/herbal medicines also organized. To bring the services of large/speciality hospitals and expert doctors closer, the VRCs provide connectivity to these hospitals. VRCs are also connected to the selected nearest district/speciality hospitals. Land & Water Resources Advisories: VRCs provide spatial information on various themes such as land use/land cover, soil, groundwater prospects, and enable the farmers to get query based decision support. A simple software package - GRAMINS is provided for accessing and querying the natural resource information and related advisories, which enables people to get online decision support. Interactive Farmers’ Advisory Services/Tele agriculture: VRCs enable online interactions between the local farmers and agriculture scientists working at Scientific Institutions. The advisory covers a wide range of subjects starting from alternate cropping systems, optimization of agricultural inputs – seeds, water, fertilizer, insecticides, pesticides and producer oriented marketing opportunities. Community centred advisories on soil and water conservation, on adopting water efficient cropping patterns, on practices related to rainwater harvesting/ground water recharge, on participatory watershed management, information on market/price, pests & diseases etc. also been made available. Weather Advisories: Short, medium and long-term weather forecasts and agromet advisories from available sources (mainly from Agricultural Universities) are provided through VRCs. Other services: Services such as governmental schemes on agriculture, poverty alleviation, rural employment, animal husbandry and livestock related services, services related to Self Help Group (SHGs) etc, are also been made available at VRCs. Identification of partner agencies is the first and foremost thing involved in setting up the VRCs. State level interaction meets were held to explain about the VRC programme and the role and responsibilities of the partner agencies. Further, members from VRC team visited the interested partner agencies to assess the infrastructure facility availability, various programmes carried out and to understand their capability in community mobilization/organization, etc. After that a MoU is signed with the partner agency and a project execution document is prepared jointly with each partner agency. Towards setting up a VRC, ISRO provides the communication and telemedicine equipments, satellite connectivity, and available/ customised databases of relevance to management of land and water resources. The partner agency provides the civil and other infrastructure to house the VRCs, manpower to run the VRCs, and also maintain the equipment and the facility after the warranty period. The responsibility of content generation and community mobilization is also the prime responsibility of the partner agency. Rapid Rural Appraisal (RRA) and/or Participatory Rural Appraisals (PRA) have been conducted to assess the livelihood pattern, natural resources stock, and information needs for development by the partner agency. People-centered multi stakeholder participatory methods have been adopted in situational analysis, planning, implementation, monitoring and evaluation of the project. VRC is envisaged to follow an equal opportunities policy that will enable socially and economically disadvantaged sections like women, landless agricultural labour households, etc to get services. Gender mainstreaming is being ensured throughout the project cycle, by implementing the project activities through gender-sensitive approaches. Local Self Help Groups (SHGs) have been involved in VRC activities. The various other local institutions such as traditional panchayats (grassroots level local institutions), local bodies, youth clubs, farmers associations, and womens’ associations are involved in defining the framework for implementation in some of the VRC areas. Concerned Line departments at the block level are also have got involved appropriately in some areas. Assam Branch of Indian Tea Association (ABITA), Guwahati etc. Rural Management & Development (RM &DD) are also partners in VRC programme. The VRCs are operated and managed by these partner agencies. In certain cases the VRCs are run by Community Based Organisations (CBOs), and they meet the expenses with limited support from the partner agency. Some other cases the expenses are borne by partner agencies from their own resources and by charging nominal fee for certain services. The VRCs address several critical gaps in existing rural tele-centres. The lessons with regards to the services delivered from rural tele-centres demonstrate that interactivity, i.e. live video-conferencing, has had a greater impact on social and human capital, in terms of exchange of knowledge, skill development, information democracy, and field-level advisories, etc. The Knowledge Connectivity to Experts at Agricultural Universities, Vocational Training Universities and Research Institutes who provide immediate solutions/response to villagers questions/concerns is the unique feature of VRCs. (iv) Skill development/ vocational training/ entrepreneurship dev. So far more than 6000 programmes have been conducted and around 400,000 people have availed the services. The above services are provided at VRCs either online mode i.e. programmes conducted using satellite based (two way video audio) connectivity with expert centres like agricultural universities, hospitals etc or offline mode – VRC centric activities like health camps, skill development, computer training, micro finance, marketing of products of SHGs, land & water resources management etc. Diversified activities and good participation are observed from the clusters in Karnataka, Tamil Nadu, Gujarat and Orissa. MS Swaminathan Research Foundation (MSSRF) VRC network, Chennai; Pondicherry Multipurpose Social Service Society (PMSSS), Puducherry; MYRADA in Karnataka, Ramakrishna Mission in West Bengal etc. have carried out a good number of offline activities. Successful conduct of Skill development training through VRCs has proved the utilization of ICT in rural areas. One year duration courses on lab technician, nursing assistant, electrician, and automobile course conducted by Sathyabama University cluster in Tamil Nadu and house wiring course and disaster risk reduction course organized by SEWA/Abhiyan network in Gujarat are excellent examples of the same. Amongst the various programmes conducted in Karnataka network, the unique programmes organized for children like “Learn with fun” i.e. Mathematics coaching class; spoken English classes, Summer camps on painting and crafts; kids fun time etc. were attended by more than 15000 students. Considering the demand from the children, the “Learn with fun” programme was separately held for 1st to 5th standard students in the morning on all week days and it shows the interest and success of the programme. The innovative “Learn with fun” programme of MYRADA VRC network has got the “Manthan – Asia Award” for the year 2008 for the ICT application in education. are also providing agromet advisory services to the VRCs. VRCs have enabled rural population to have access to quality health care. Apollo Hospital Ahmedabad provides teledermatology, tele-ophthalmology and tele pulmonolgy consultations to Gujarat VRCs. Health awareness programmes are also conducted by Apollo Hospitals. Tele-ophthalmology consultations provided by Tarabai Desai Eye Hospital & Research Centre, Jodhpur is unique one with follow up free operations. MSSRF VRCs in association with Sankara Nethralaya also provide ophthalmology consultations. Tele health care programmes provided by Himalayan Institute Hospital Trust, Dehradun; Global Hospital, Mount Abu, Eras Medical College, Lucknow, and many others are the classic examples of usage of modern technology for the benefit of rural poor. Short term courses conducted by NCHSE in Madhya Pradesh on Remote Sensing and GIS to the planners, govt. officials and NGO representatives using the VRC network was well appreciated by many. Convergence of VRC activities with other rural development initiatives, supported by other funding agencies like UNICEF, Azim Premji Foundation etc. are seen in School of Desert Sciences network in Rajasthan and MSSRF network in Tamil Nadu. This has helped in organizing a lot of activities towards improving health and sanitation system, health insurance, tele-education, capacity building etc. VRC network has also witnessed a few national Virtual congresses, wherein, many intellectuals, policy/decision makers, academicians, Govt. Officials and General public discussed various issues face to face from various corners of the country. National Virtual Congress on “Celebrating Women’s Contributions to Safeguarding and Strengthening Ecological Security” organized as part of the First Indian Youth Science Congress; ‘National Virtual Congress of Mahila Kisans’ organized during 95th Indian Science Congress; Discussion on traditional herbal medicines etc. are some of them. Children benefiting from career guidance; treatment of patients for dermatology, ophthalmology and other problems and people getting cured of their problems after tele consultations at VRCs. People who attended skill development courses (which includes theory classes through VRC network and practical at nearby place) getting jobs or taking up own job; livestock advisories resulting into saving of cattle, poultry etc; agro advisories helping farmers in getting better production, adoption of new crops etc; use of natural resources data base at VRCs for wasteland reclamation, watershed development, extension of crops etc. However exact quantification of the benefits accrued has to be made. At the same time, it is observed that some VRC clusters only are carrying out diverse programs/services and others are focusing on two to three services, while some does not carry out regular programmes. Use of Natural Resources data is also minimal. In many VRCs quality/adequate power (electricity) is not available. Manpower is also a matter of concern in some VRCs. Some Clusters are having sustainability plans while others yet to work on that. Efforts are made to address these concerns. Expanding the network requires additional satellite bandwidth, infrastructure, servers etc; ISRO is working in this direction. It is also proposed to set up an exclusive Content Server for storing and retrieving Programmes across the network. VRC programme will also become an integral part of the initiative ‘ Rashtreeya Gramin Gyan Abhiyan’ (National Rural Knowledge Movement) to provide connectivity to all the villages in India, in which, it is planned to provide satellite based VRC connectivity to almost 4000 blocks (sub District level) by the end of 11th Five year plan. Further, the last mile approach to the panchayaths and villages will be achieved by other ICT means like wireless, community radio, cell phones etc. This is planned with the participation from, government, civil society organisations, bilateral and multilateral donors, private and academic sectors.